Google Page Rank Updated January 20th 2011, PR 3 for HackTutors! 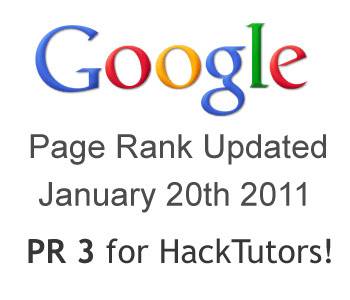 Today, I'm very happy to say, Google Page Rank is updated in January 20th 2011 and HackTutors got PR 3 (PR 0 before). This is the major Page Rank Update from Google! It had been long time, Google Page Rank was not updated. Last time, Google updated PR in April 2nd 2010. But now a years after, finally they took the action. I hope, I'll get more plus PR in next update. And yes, don't forget to check your PR immediately using any PR checker tool. Share your happiness here via comment! Hack Tutors — Blogger Tricks, Blogging and Social Media Tips: Google Page Rank Updated January 20th 2011, PR 3 for HackTutors!